Potter Cove is a cove indenting the south-west side of King George Island to the east of Barton Peninsula, in the South Shetland Islands of Antarctica. Potter Cove was known to sealers as early as 1821, and the name is now well established in international usage. The cove is the location of a replica of a metal plaque erected by German whaler and explorer Eduard Dallmann to commemorate the visit of his expedition, on 1 March 1874, with the sailing steamer Grönland. 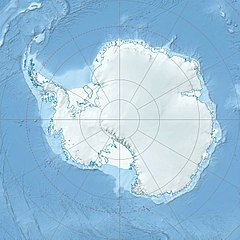 It has been designated a Historic Site or Monument (HSM 36), following a proposal by Argentina and the United Kingdom to the Antarctic Treaty Consultative Meeting. ^ "Antarctica". The Lighthouse Directory. University of North Carolina at Chapel Hill. Retrieved 23 May 2017. ^ "List of Historic Sites and Monuments approved by the ATCM (2012)" (PDF). Antarctic Treaty Secretariat. 2012. Retrieved 2013-12-30. This article incorporates public domain material from the United States Geological Survey document "Potter Cove" (content from the Geographic Names Information System). This King George Island (South Shetland Islands) location article is a stub. You can help Wikipedia by expanding it. This page was last edited on 28 March 2018, at 13:53 (UTC).